Like many chefs, Josh Gadd got his first taste of restaurant life slugging it out as a dishwasher. “I didn’t even apply for the job,” he said. Gadd was only 14 when the phone rang and chef Alastair Mackay asked him if he would be interested in washing dishes for his upscale restaurant. That’s when the young teen went to work in the dish pit at On the Front. It wasn’t long before McKay asked Gadd to help with food preparation. Then, one day when an On the Front cook was fired, Gadd stepped up. “ I learned the appetizer station that day and it just went from there,” he said. When Gadd finished high school Mackay urged him to enroll in Lambton College’s apprenticeship program where Mackay was an instructor. That began two years of culinary study at the college, as well as full-time work at the restaurant. 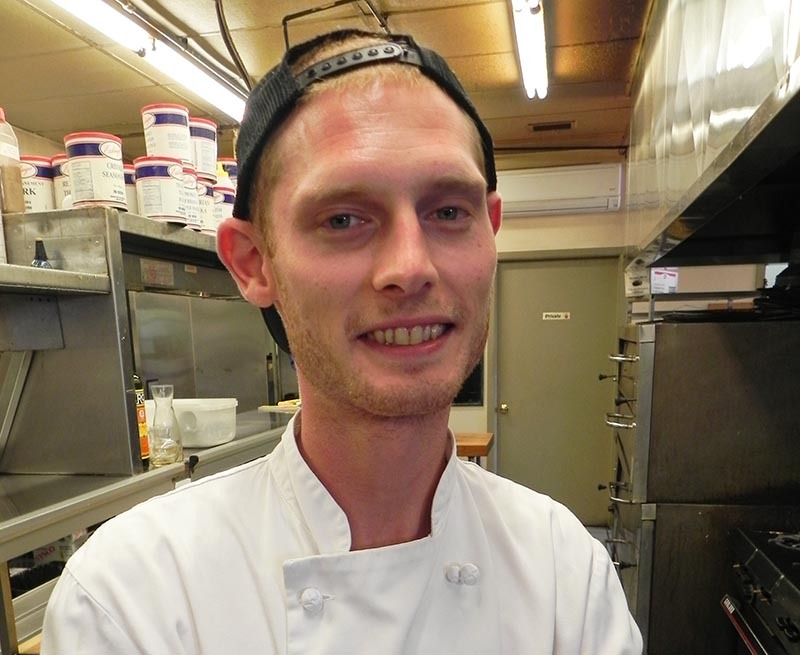 “I stayed at On the Front for six years, then became the sous chef at Limbo Lounge for five more years,” said Gadd, now 29. While waiting for Limbo to open downtown he took a temporary job at Olive’s Casual Cuisine, at 1591 London Line. “I like fine dining,” Gadd said, explaining most of his career choices. Two years ago, Gadd became the head chef at Olive’s, taking on the responsibility of a 90-seat restaurant. “I like it when the pressure is on and your blood is just pumping,” he said. During Gadd’s interview with The Journal, employer Olive Archibald announced she had sold the restaurant and is retiring at the end of July. Gadd expects he will continue as head chef. Long-time servers at Olive’s, Jane Huggett and Stephanie Grant, have bought the restaurant. She said she built her reputation on good, basic cuisine, having owned The Garden Tea House at DeGroot’s Nurseries for 13 year and a catering business prior to that. That suits Gadd just fine. He focuses on beef, chicken and fish at Olives. “The most exotic we get is maybe duck, sometimes pheasant, bison, or venison,” he said.